A 19-year old Rashmi is the youngest daughter of her parents, who resides in Sabbavaram (Andhra Pradesh). Her father, a daily wage laborer, who is finding it difficult to make ends meet. So, her mother started working to support him for the minimum requirements of her family. 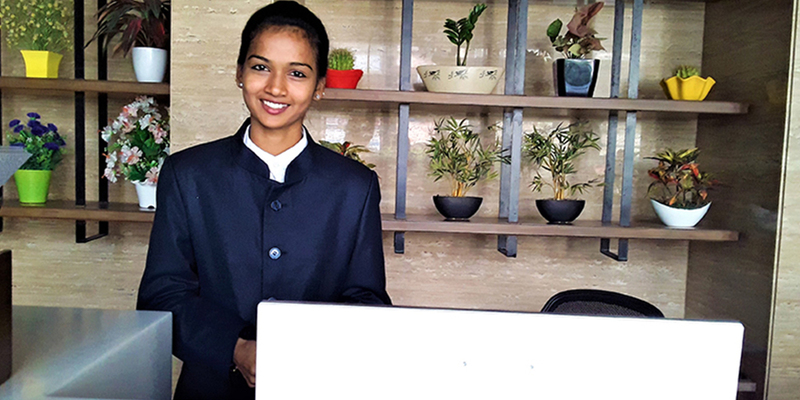 Instead of choosing for higher studies, Rashmi was searching for an employment opportunity so that she will be a helping hand towards the same. One fine day when the trainers were on the Mobilization activity, Rashmi was introduced to the Bosco Academy for Skill & Employment (BASE) program that offers three months livelihood training. This skill development program is funded by Accenture under the ‘Skills to Succeed’ to empower the disadvantaged youth with market driven skills. During the mobilization, the trainers explained her about the skill development program, which is specially designed to enhance skills of the deprived and disadvantaged youth. It also assists them in getting an entry level opportunity in the job market. The very next day she visited the training center accompanied by her mother and got selected for the Hospitality domain. Though she is in need of an employment at least with a minimum salary to support her family financially but due to lack of skills, it is really difficult to get a job in the market. On the day of counseling, Rashmi shared all her problems with the trainers and her eagernees for a job. So, the trainers also agreed to make her a part of the skill training program. She joined with a hope to earn a basic livelihood. She completed the training in Food & Beverage Steward and also successfully passed the examination conducted by the assessing body. Her attitude towards learning technical skills is appreciable. During the training period, Rashmi is always found to be very attentive and sincere to the classes. She is blessed with an amazing grasping power, which she utilizes carefully at learning new things. As a part of the program, Don Bosco Tech assisted everyone to find an employment after the training. Rashmi also appeared the campus interview organized by Don Bosco Tech and selected for Front Office Executive in V Hotel located in Vishakhapatnam. Now she is working in Front Office for a salary of Rs.11,000 per month and also privileged with other benefits like free food and accommodation. Her parents are very happy at this success. She says that I am very happy and grateful to work in this Organization.